The latest Gearman version available in the EPEL repository is not always up to date. The latest version of Gearman at this moment is 1.1.6. So, here is the procedure to install the Latest version from source. It’s easy to install but I’ve run into some problems while installing that in an amazon EC2 large instance. So added the troubleshooting parts too. That’s all, gearman is installed and ready to use. Unfortunately, for my case it shows couple of errors and then terminated. Here is how I resolved that. The solution was hard to find, but as it suggests it is failing because the -std=c99 is required. The libhostile C code requires C99. There are some bug reports for this, but forcing the CFLAGS environment variable will fix this. Solution: Run ./configure –help, you will see a list of configurable variables. Solution: The solution is simple, i had missing “mysql-devel” package. So installing it solves the problem. Hope that it’ll help someone. I was a speaker in the phpxperts seminar 2010 here in Dhaka. The event was fabulous! Big crowd; Big arrangement; Excellent show! Nearly 400+ people participated the seminar with a festive zeal and waited 6-8 hours until it reached to the end! That was awesome. The other topics for the seminar was also very interesting and covered a wide variety of subjects. Here is my talk, “Even Better Debugging; equipped yourself with powerful tools”. It was aimed for the PHP developers to make them aware of the debugging techniques from primitive to the advanced. Anyway as the time was limited to only 14 minutes i couldn’t cover much interesting things. Have a wish to create the second part of this slide. Any of your comments, feedback will be appreciated!! Even better debugging; Equipped yourself with powerful tools. View more presentations from usamurai. what is a Referrer Spam? But be known that spam referrals will NOT affect the site’s search engine positions (SERP`s), these 2 issues are COMPLETELY unrelated. How the spammers do it? The spammers can collect the GA accountID`s (e.g UA-0000000-1) in a number of ways and then can paste these accountID found above into GA tracking code hosted on their domains e.g. camera-digital.golbnet.com and then can send traffic to these internal pages. It happens as any webpage that has the tracking code of your Analytics account installed on it will be tracked by your Analytics account. This is irrespective of whether it is your domain or not. The only way to stop tracking the page would be to remove the code from it by contacting with the site owner. 3. Do a “Site Search” in the suspected site. e.g. 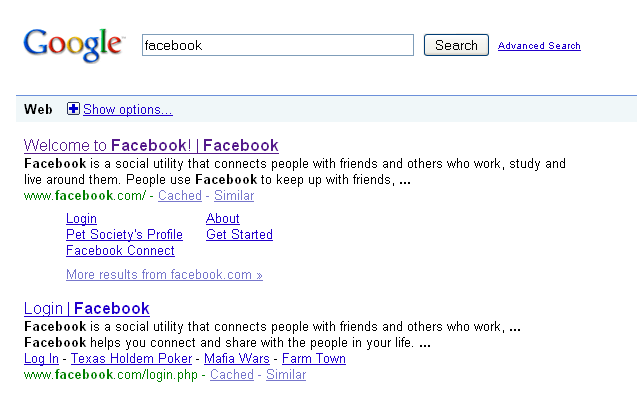 do a site search on gps-brasil.blogspot.com to find the page with your accountID. Add an include Hostname filter for youdomain.com to prevent faked visits from thebesthosting .org and others. IMPORTANT: it is best to have a backup profile with no filters applied. Thus if you accidentally clicked the “exclude” button rather than “include” or mistyped you domain name, then no traffic would be included, so be careful with filters using the hostname field. * google cache, MSN translate visits will also be shown in the hostname report. This is because when a user views the cache of your page, the tracking code still runs, but this is hosted on google servers not your hostname. if you search with the term “somewhereinblog” in google, you will see google sorted up some sitelinks for you(see the screen shot below). viewing the sitelinks in the result, some questions quickly ran through in my mind and finally i got the answers which i would like to share with you all. 1. question #1: can i set such links for my other sites also? snippets are automatically generated. so you can’t place them by paying money. sites with traffic levels above a certain level are usually listed with snippets. sites with high traffic might not include snippets in the listing if the most relevant page being served is not the homepage. so somewhereinblog has good traffic. sitelinks for other sites is subject to the traffic, you can do nothing here other than trying to increase the traffic of your site. 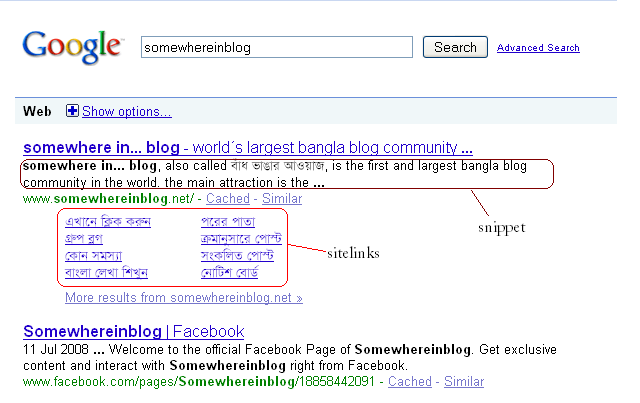 2. question #2: can i customize the sitelinks ?i want to place some other links say “groups”, “bangla settings”, “kono somosha” etc. under the result rather than showing some other less important links. the google snippets’ sitelinks are usually the most popular links as determined by visitor usage ( it collects site usage data via google analytics, google toolbar etc.). so i can’t add my favorite links here… it is created automatically based on popularity to help the users to go there directly. 3. question #3: but i don’t like some links anyway… can i remove the links that i dislike ? if you think that the sitelinks displayed for your site are inappropriate or incorrect, you can block them so that they no longer appear(from “webmaster tools”). it’s also notable that google only display sitelinks when a site has a minimum of three sitelinks available. if you have two or fewer unblocked sitelinks, no sitelinks at all will appear in google search results for your site. so, now things are pretty clear to me. not bad at all. but getting the right answers need me to search several times in several ways. so i thought it would be better to share it with you all. may be you also find it interesting. N.B. it’s a pretty old note. posting lately ;).